Gildersleeve became enormously popular. So popular, in fact, that the first ever spin off was made with the Great Gildersleeve becoming one of radio’s most memorable hits. 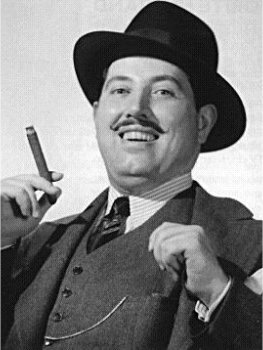 Perry’s star rose during his 9 Seasons on the Great Gildersleeve. He also played Gilldersleeve in nine movies, four with Fibber McGee and Molly, four Gilldersleeve movies, and one additional film with Victor Mature and Lucille Ball. However, Perry became disatisfied with the status quo. He had a solid crooning voice that he felt was underused on Gildersleeve. The late 40s and early 50s marked CBS famous talents raid. Beginning with bringing Jack Benny to CBS, they began to take talent from other networks left and right including Burns and Allen. CBS offered Perry a fat contract, however Kraft refused to let Gildersleeve go to CBS forcing Perry to launch a new program, The Harold Perry Show. Despite the support of Joseph Kearns, Parley Baer, and Jane Morgan from Our Miss Brooks, the show was a one season flop due to poor and inconsistent writing. The decision to jump networks sent Perry’s career back to character work. Meanwhile, Gildersleeve went on until 1957 with Willard Waterman taking over the role and bringing Gildersleeve to the small screen in 1955. Still, Perry is generally regarded as the better Gildersleeve due to the strength of the character for the eleven seasons he played it. Despite Perry’s poor decision, his laugh and voice make him an indispensable part of radio history. Arch Oboler was one of radio’s master playwrights. Fans of radio horror will remember him for his work on the horror anthology series Lights Out. However, his talent went far beyond the genre of supernatural thrillers. He was capable of writing moving drama and deep philosophical pieces to rival Norman Corwin. He had not one, but two radio series of plays he’d written called Arch Oboler’s Plays. During World War II, he wrote dramatic plays for such programs as Plays for Americans, Everything for the Boys, and Everyman’s Theater. Oboler worked to secure his legacy by repackaging and resyndicating twenty-six programs (twenty-five from Lights Out as The Devil and Mr. O.Thus, his legacy lives on.